EVERETT, Wash., Sept. 4, 2013 – Boeing [NYSE: BA] and FedEx Express, an operating company of FedEx Corp. (NYSE: FDX), celebrated today the delivery of the Memphis, Tenn.-based express shipping company’s first 767-300 Freighter. The delivery supports the FedEx strategy to modernize its fleet with more efficient freighters. Pictured here is FedEx’s first 767 Freighter in flight. EVERETT, Wash., Sept. 4, 2013 /PRNewswire/ -- Boeing (NYSE: BA) and FedEx Express, an operating company of FedEx Corp. (NYSE: FDX), celebrated today the delivery of the Memphis, Tenn.-based express shipping company's first 767-300 Freighter. The delivery supports the FedEx strategy to modernize its fleet with more efficient freighters. "Today's delivery of our first Boeing 767 Freighter is another step forward in our fleet modernization strategy," said James R. Parker, executive vice president of Air Operations, FedEx Express. "The 767 is approximately 30 percent more fuel efficient and has unit operating costs that are more than 20 percent lower than the aircraft they will replace. The net effect is an aircraft that is more affordable to operate and has lower carbon emissions because of better fuel efficiency." 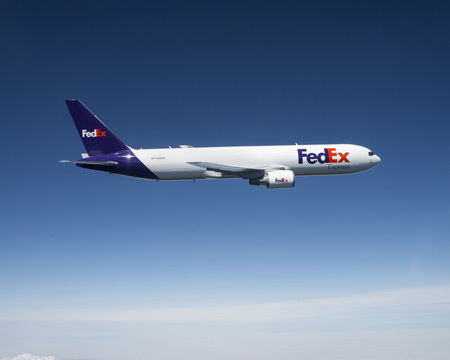 The 767 Freighter is an ideal upgrade for the fleet serving the FedEx Express domestic network, providing improved fuel, maintenance and cost savings over the MD-10 freighters it will replace. FedEx Express gains additional efficiency through the ability to share parts, tooling and flight simulators between the 767 and the more than 70 757 Freighters already in its fleet. "We are excited to see the 767 Freighter join the FedEx fleet," said Brad McMullen, vice president of North America Sales, Boeing Commercial Airplanes. "The 767 Freighter, with its tremendous efficiency among medium wide-body cargo airplanes, will complement FedEx's fleet and support fast, reliable deliveries to customers around the world." The 767 Freighter is based on the popular 767-300ER (extended range) passenger airplane. Able to carry approximately 58 tons (52.7 tonnes) of revenue cargo with intercontinental range, the 767 Freighter is ideal for developing new long-haul, regional or feeder markets. The airplane joins other Boeing freighters in the FedEx fleet such as the MD-10, MD-11, 757 and the 777.